great. It saved me time and improved the appearance of my business proposals. Highly recommend this product to any business owner or sales person." This Application for Records Retention Form is included in an editable format that can be customized for your own needs. Describe the content of the records to be stored such as: Invoices, Contracts, Sales Orders, Bid Documents, Annual Review, etc. List Record Types Retention: ( i.e. 3, 7, 10 year) Legal Regulations. SOX, HIPPA, PCI, etc. Media Type: (Physical or Electronic) Search Metadata Access Requirements Estimated Volume. Pages or file size. PRINTED NAME AUTHORIZED SIGNATURE DATE. 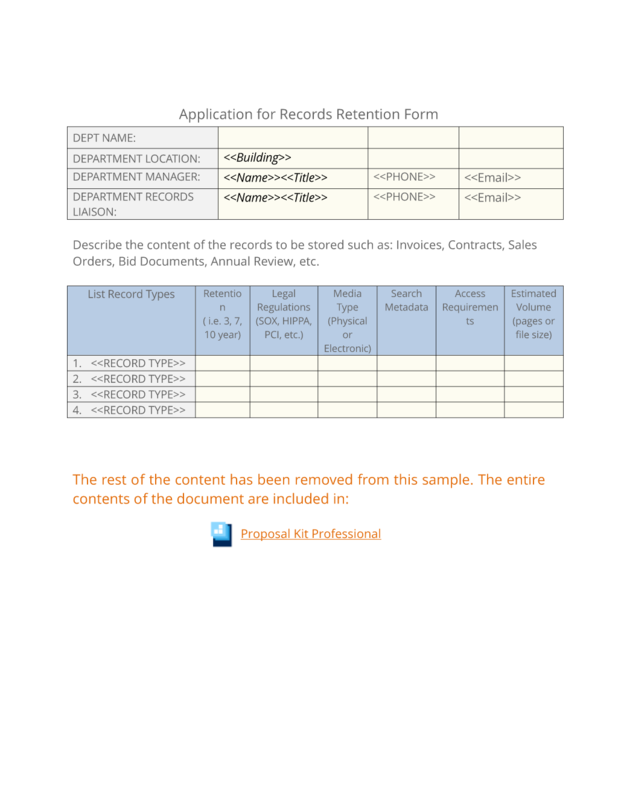 The editable Application for Records Retention Form document - complete with the actual formatting and layout is available in the retail Proposal Kit Professional.